The New York Times today had a article by Micaela Baranello about Florence Price. In November 1943, the composer Florence Price wrote to Serge Koussevitzky, the music director of the Boston Symphony Orchestra, asking him to consider performing her scores. It was her second letter to Koussevitzky; there is no evidence he ever replied to her. 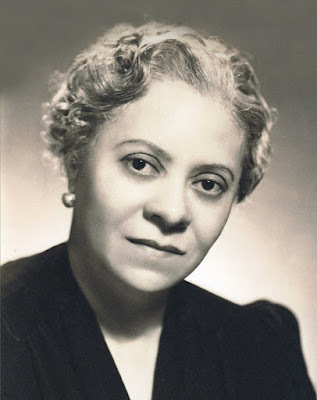 Price (1887-1953) was the first black woman to have her music played by a major American orchestra when the Chicago Symphony performed her Symphony in E Minor in 1933. She was a prominent member of the African-American intelligentsia, corresponding with W.E.B. Dubois and setting to music poems by Langston Hughes and Paul Laurence Dunbar. But after her death, she swiftly faded into the background of a canon dominated by white men, and much of her work was thought to be lost until a trove of manuscripts was discovered in 2009, in what had been her summer home outside of Chicago. Among the pieces found were her two violin concertos, the first recording of which has been released this month by Albany Records, with Er-Gene Kahng as soloist and Ryan Cockerham conducting the Janacek Philharmonic. Born to a middle-class family in Little Rock, Ark. — her father was the city’s first black dentist, and the governor was said to have been his patient in secret — Price later wrote that she traveled with her mother to England and France at the age of 5. She was a star when she attended the New England Conservatory, one of the rare private composition students of the school’s president, the eminent composer George Whitefield Chadwick. In 1893, the composer Antonin Dvorak proclaimed that an American art music should be built on African-American idioms. The musicologist Douglas Shadle has pointed out that, while white composers eagerly took up this directive — arguably culminating in George Gershwin’s “Rhapsody in Blue” — many largely forgotten African-American composers did as well, and often took exception to what they saw as white appropriation.